Vollrath 52869 Birchwood Melamine Round Serving Bowl 34 oz. TigerChef > Dinnerware > Melamine Dinnerware > Melamine Serveware > Melamine Bowls >< Melamine Serving Bowls > Vollrath 52869 Birchwood Melamine Round Serving Bowl 34 oz. 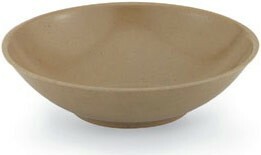 A versatile addition to your dinnerware collection, the Vollrath 52869 Birchwood Melamine Round Serving Bowl 34 oz. is perfect for serving soups, salads, and desserts. Designed with durability in mind, this impact-resistant product is made from high quality melamine that is strong enough to endure daily use and withstand heat up to 187°F. Perfect for entertaining and everyday dining, this item has a smooth surface and Birchwood shade that easily complements any table setting. Thanks to its dishwasher safe design, this serving bowl ensures fast and convenient cleanup.